Samsung finally announced its latest Galaxy S5 smartphone at the Mobile World Congress in Barcelona. The smartphone comes with some new features such as a 16 megapixel camera, a heart-rate monitor, and hybrid auto-focus to name a few. You can check out the full detailed list on our site. The Samsung Galaxy S5 is a 5.1-inch upgrade to the year older Galaxy S4 and sports a full HD screen with the same Super AMOLED panel. So clearly, the rumours of the S5 having a 2560×1440 pixel were just that. But where the rumour mills got it right was about it being dust-proof and water-proof. in terms of design there are no major visible improvements in the front. However, the home button also functions as a finger-print reader. It comes with the same plastic cover, though there is a metal variant of the S5 as well. On the rear-side, just below the camera module, you have a heart-rate monitor. 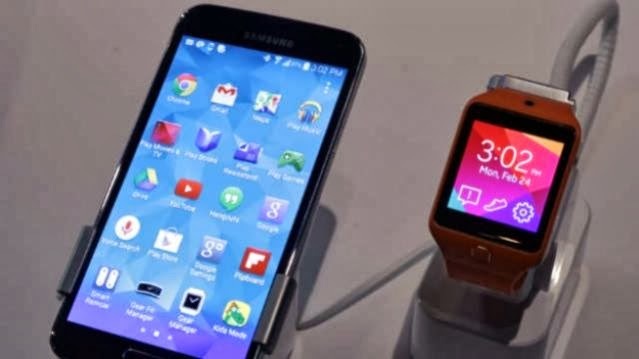 The Galaxy S5 seems to be taking the health and fitness tracking to the next level with the Galaxy S5. The rumour mills got this one right as well. Samsung Galaxy S5 does indeed come with a finger-print sensor, a feature introduced by Apple with its 5S. 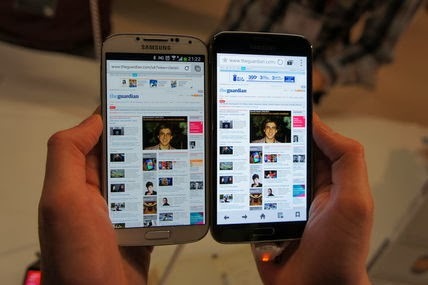 Samsung however claims that their implementation is different. It can recognise three separate finger prints and it takes eight swipes to register, instead of holding down on the home/fingerprint scanner button. You can unlock the phone using finger-print recognition and can even authorise PayPal to make payments. 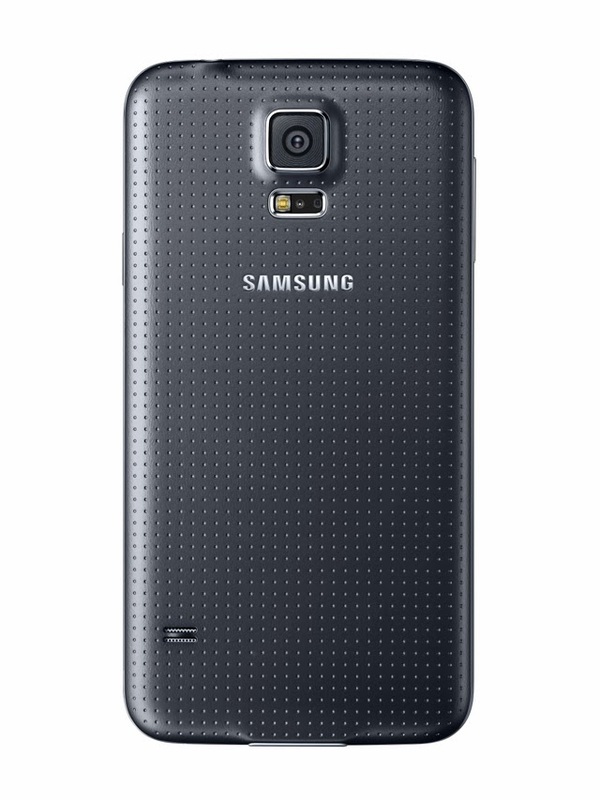 The Samsung Galaxy S5 comes with a 16MP camera with improved menu and user interface. It claims to have an autofocus speed of 0.3 secs and an advanced High Dynamic Range (HDR) mode. The Samsung S5 rear camera will feature phase-detect and contrast detect AF, which is generally seen on high end cameras. This really should boost up the AF speed. On the front there is a 2.1MP camera. The new Selective Focus Feature allows users to focus on a specific area of an object while simultaneously blurring out the background. It also comes with a post-capture refocus feature. Another interesting feature is its ability to shoot 4K video, although you will need to watch the full res video on a 4K TV. Samsung Galaxy S5 supports the fifth generation 802.11ac WiFi and it uses LTE Category 4 standard. A feature called Download Booster allows you to bond the WiFi and LTE connections simultaneously to improve download speeds. The very fact that Samsung has placed a heart-rate monitor under the camera module speaks volumes about its commitment to health and fitness tracking. With the new S Health 3.0, the Galaxy S5 provides a personal fitness tracker with tools such as pedometer, diet and exercise records and a new built-in heart rate monitor. An optical heart-rate monitor which works with your fingertip is also included on the Galaxy Gear 2 smartwatch. The Samsung Galaxy S5 runs on a 2.5GHz Snapdragon 800 SoC with 2GB of RAM. It will ship with Android 4.4.2. It comes in the 16GB and 32GB variant with microSD slot for adding in a microSD card upto 64GB. It packs in a 2800mAh batter which gives talk time of 21 hrs. A new feature called the Ultra Power Saving mode, claims to give you a 24-hour battery even when your phone shows the battery capacity at 10 per cent. It weighs 145g and is just 8.1mm thick. The Galaxy S5 is IP67 dust and water resistant. It also offers a Finger Scanner, providing a secure, biometric screen locking feature and a seamless and safe mobile payment experience to consumers. The Ultra Power Saving Mode turns the display to black and white, and shuts down all unnecessary features to minimize the battery consumption. It’s said to let your phone be in standby mode for 24 hours even at 10 percent battery. Pricing details are yet to be released. We will update it as soon as its up. The Samsung Galaxy S5 will hit the markets on April 11th. Stay tuned for more updates on the Galaxy S5.